The #1 Spanish English Dictionary for iPhone, iPad and iPod touch. 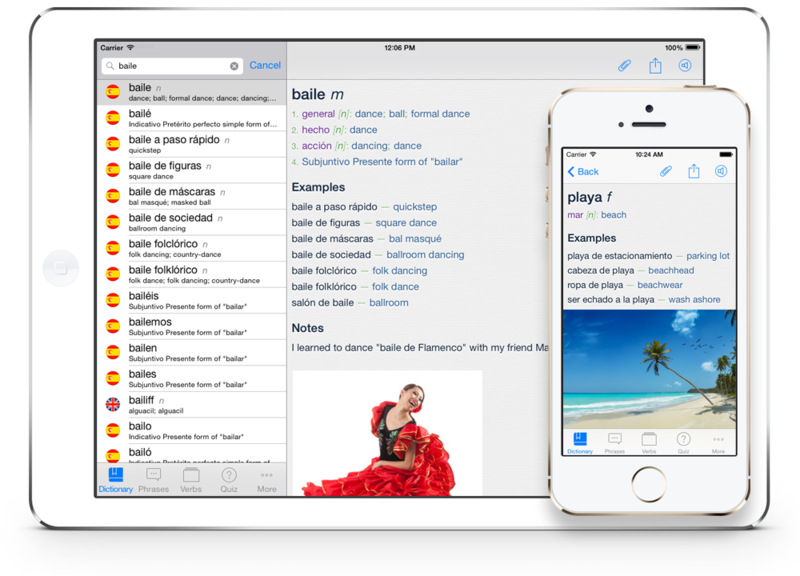 Advanced features and extensive content make VidaLingua the most comprehensive Spanish English Dictionary for iPhone, iPad and iPod Touch. Best Offline Spanish English Dictionary! A must have for learning a new language! " Between it's incredibly extensive vocabulary and excellent conjugations it has gotten me through many a conversation while traveling! " Awesome! This app does everything a dictionary should do and more! " Fantastic App - I have 4 or 5 Spanish Apps and this is the absolute best. " Best Spanish English Reference - Hands down the single most important Spanish app to have on your iPhone. Worth every penny. " Spanish English Dictionary with over 668,000 offline entries. Includes translations, usage examples, parts-of-speech and gender of Spanish nouns. Compiled and updated by professional linguists. Twenty categories such as Conversation, Asking Directions, Eating Out, Flirting and Making Friends. Search on key word. Hear phrases pronounced in Spanish or English. Add your own phrases to the phrasebook. Conjugations of 6,419 Spanish & English verbs in all major moods (Indicative, Subjunctive, Conditional) and tenses (Present, Past, Future, Perfect, Pluperfect, Future Perfect). Over 70 conjugations per verb, more than 450,000 in all. Text-to-speech pronunciation of all dictionary entries, translations, usage examples, phrases and verbs. Settings for accents (US, UK, Australian, Spain, Mexico) and speed (slow, medium, fast). Offline and higher quality online voices. Studies have shown that image association increases retention. The dictionary includes thousands of offline images for menu items, plants, animals, etc. When an image is available an icon will appear below usage examples. Language is living! Only VidaLingua allows you to add notes, images, phrases and audio to your entries. Spanish English Dictionary + is an engaging travel companion, enriched by your learning experiences. Download it now from the App Store and start learning today!